Give your family and friends a treat and dine at the Iron Chef, where you will be guaranteed a fine dining experience. Our professional chefs will not only provide excellent food, but also create an enticing atmosphere. Watch as they transform the art of cooking into a performance of juggling agility, each with their own style and showmanship. 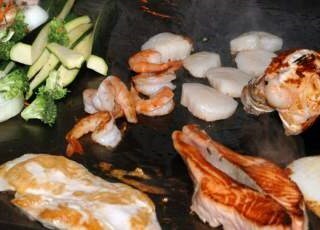 With both quality and variety, the menu includes favorites such as New York Steak, Filet Mignon, Chicken, Shrimp, Scallop and Lobster. 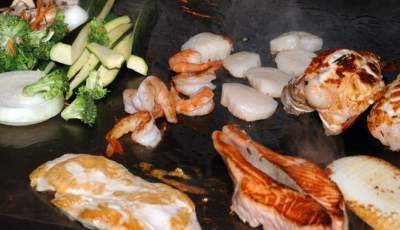 We make sure your meal is as enjoyable as possible, with all meals seasoned and grilled right before your eyes. A wide range of wine and cocktails await you to complement the dishes.